Where there is water, there is life, not only literally, as in the Nile River in Egypt and in the cities of Mesopotamia, but also symbolically, as we read in the words of the prophet Ezekiel, who in vision saw a magnificent spring of fresh water flowing east from the temple, healing even the waters of the Dead Sea (Ezekiel 47). A psalm also testifies to the divine beneficence of water (Psalm 1) and John, in Revelation, quotes the Lord as giving to those “athirst of the fountain of the water of life freely” (21:10‒14), a “crystal clear river” that flows from the center of the temple in the New Jerusalem. Also in the last days, “in the barren deserts there shall come forth pools of living water” (Doctrine and Covenants 133:29). 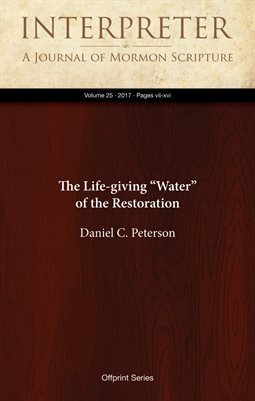 We, the writers and volunteer staff of the Interpreter Foundation, invite readers to help spread and defend the life-giving water of the Restoration, for “the harvest is plenteous, but the labourers are few” (Matthew 9:37).